Luckyfinds: Treat yourself to a Goldilocks Infinity Cake! Treat yourself to a Goldilocks Infinity Cake! As Thanos attempts to wreaks havoc on the universe, the earth is in dire needs for protection from its mightiest heroes, The Avengers! 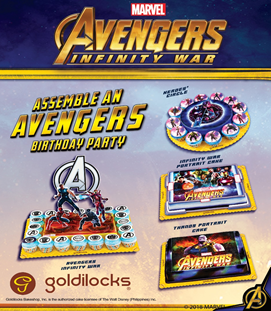 With everyone on the Avengers team risking their life to save us from harm, Goldilocks, the number one bakeshop aims to celebrate these heroes with the release of their Avengers: Infinity War themed cakes! Treat your kids (or yourself, we won’t judge) to a superhero celebration like never before with The Avengers: Infinity War themed cakes, a selection of your favorite superheroes as they prepare to combat the Evil Thanos and his army of underlings. With the images of notable heroes such as Iron Man, Black Panther, Spiderman, and many more. You will truly feel the power of Earth’s Mightiest Heroes! Support your favorite heroes make your next party Super-awesome and pick up any Avengers: Infinity War themed cake from any Goldilocks branches nationwide.